Before I started my abroad journey in London, I knew that logistically it may not work out that I would be able to go to Vilnius. After all, it’s not exactly high on the typical study abroad student’s list of must-see cities. I thought that even if it worked out for me economically and academically for me to go, there was no way I would be able to convince anyone to go with me — despite my attempts to sell others on the idea. Against the odds, however, I didn’t have to make the journey by myself. One of my best friends who is studying abroad in Copenhagen this semester agreed to go with me and split an AirBnb. Vilnius is the capital of Lithuania, a country that I’ve studied in detail for quite some time. Last semester I wrote a large research paper for Professor Ciancia’s “Migration & Me” history capstone course in which I traced my family’s emigration from Lithuania in the early 20th century to Illinois, USA. After studying Lithuania’s history in detail, I had always intended on somehow making my way over there at “some point”. But the personal connection to Lithuania has always been strong for me, renewed even further after my completion of my seminar paper. Perhaps it was for this reason that I felt so determined to not just visit Lithuania briefly, but stay for five days — my longest trip so far. When I say that my trip to Vilnius was worth it, I don’t think that there’s any way I can convey through text how much I mean that. Vilnius has a much different vibe from other major European cities and at first I couldn’t quite figure out what it was. When I listened to the people around me, however, I realized what it was — Vilnius in February is almost completely devoid of tourists. For a travelling student with a limited budget, this was a dream come true. Less tourists means lower prices, so my friend and I were able to eat like royalty for pennies. And Eastern European food is not your overpriced airport sandwich that you eat and still feel hungry afterwards. 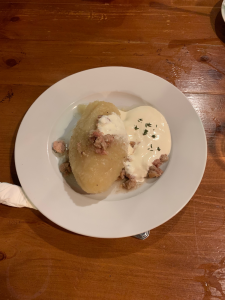 Ceplinai is the national dish of Lithuania! It’s boiled potato with a meat filling, topped with sour cream and bacon. Beetroot soup is common across Eastern Europe and is always served with sour cream and rye bread. 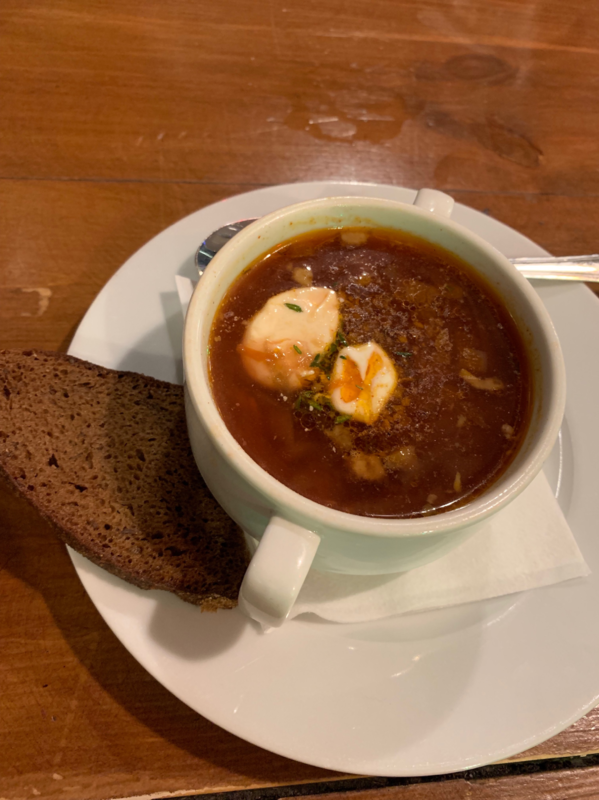 The famous Lithuanian beetroot soup is Šaltibarščiai, which is a cold version of this soup that is bright pink, but I didn’t try it on this trip because Šaltibarščiai is a summer dish! Of course, there’s much more to see in the city besides just the glorious food. Although Vilnius is the historical capital of Lithuania, it has a rich history that spans from the medieval Polish-Lithuanian Commonwealth where it was a Polish city, to being occupied by Nazi and Soviet forces during World War II. 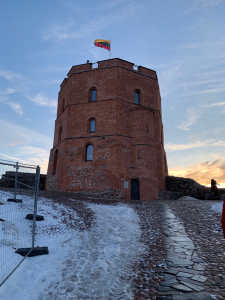 One of our stops included hiking up the iconic Gediminas Tower, which is the remaining portion of what used to be the medieval Upper Castle. Gediminas tower is a historical symbol of Lithuanian identity and pride. Other stops included trips to the Palace of the Grand Dukes of Lithuania where we learned more about Lithuania’s medieval history as it once was the Grand Duchy of Lithuania, spanning a very large geographical portion of Europe at its height, the historic Vilnius University, and several historical Orthodox and Catholic churches. We also visited the Museum of Freedom Fighters, formerly named the Museum of Genocide Victims, which pays tribute to the Lithuanian partisans and citizens who were deported to labor camps in Siberia under Soviet rule. On the third day of our trip, we decided to take a train from Vilnius to Kaunas. This in itself was very easy and affordable to do; however, navigating the Kaunas public transportation system proved challenging. Because all of the city maps we found in the area were written in Lithuanian, we winded up at the mercy of Google Maps. This wasn’t bad at first and we thought it was nothing we couldn’t handle — we managed to get to the Old Town without much trouble. Unfortunately, this was not the case when we tried to get to Ninth Fort. After the shuttle bus Google told us to take dropped us off, the pedestrian walkways ceased. We were on our own, at the side of the road, relying on Google Maps like it was a map out of a maze. The only safe way for us to walk there was through a ton of mud, which coated our shoes and splashed onto our jeans. Needless to say: I do NOT recommend walking to Ninth Fort. Find a taxi to take you there if you go to Kaunas — think of your shoes! The fort itself, of course, made us forget about our soaked shoes. Sometimes there are things in life that are much worse. 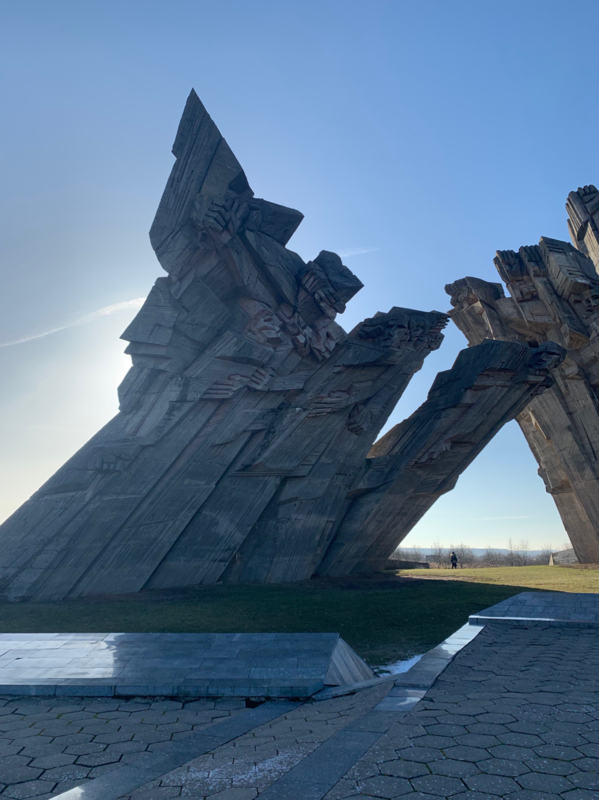 This art piece at Ninth Fort pays tribute to the thousands of Kanaus Jewish citizens who were executed and buried here under Nazi-occupied Lithuania during World War II. This was a very somber but important place to visit in Kaunas. In the end, the small challenge and cultural differences I experienced in Lithuania made the whole experience that much more memorable. Every day since the trip, I have felt more of a desire to go back there than any other place I’ve been to so far. I can only imagine what it’s like in the summer when there are more festivals and local markets around. In the meantime, however, I’m content to be in London. I do miss the Lithuanian food, but thanks to London being a mosaic of different cultures, I found out that there’s a Lithuanian grocery store called Lituanica where I can get all the Lithuanian rye bread I need. Who knew?